In response to House Speaker Nancy Pelosi's recent statements on the church's teaching on abortion, Archbishop George Niederauer of San Francisco -- the top Rep.'s hometown ordinary -- prepared the following column for tomorrow's edition of the archdiocesan weekly, Catholic San Francisco. Last month, in two televised interviews and a subsequent statement released through her office, Nancy Pelosi, Speaker of the U.S. House of Representatives and a Catholic residing in the Archdiocese of San Francisco, made remarks that are in serious conflict with the teachings of the Catholic Church about abortion. It is my responsibility as Archbishop of San Francisco to teach clearly what Christ in his Church teaches about faith and morals, and to oppose erroneous, misleading and confusing positions when they are advanced. In his statement about Speaker Pelosi's remarks, Archbishop Donald Wuerl of Washington, D.C., expressed the response of many bishops when he said, "We respect the right of elected officials such as Speaker Pelosi to address matters of public policy that are before them, but the interpretation of Catholic faith has rightfully been entrusted to the Catholic bishops." In addition to Archbishop Wuerl, several other bishops have already appropriately and helpfully pointed out the errors in the Speaker's remarks. Nevertheless, it is my particular duty to address them as well. Let me acknowledge even as I do so that Speaker Pelosi is a gifted, dedicated and accomplished public servant, and that she has stated often her love for her faith and for the Catholic Church. The Speaker has been supportive of legislation that helped to implement some of the social teachings of the Church. However, her recent remarks are opposed to Church teaching. In The Catechism of the Catholic Church we find this statement: "Human life must be respected and protected absolutely from the moment of conception. Since the first century the Church has affirmed the moral evil of every procured abortion. This teaching has not changed and remains unchangeable. Direct abortion, that is to say, willed either as an end or a means, is grossly contrary to the moral law." (2270 - 71) The Catechism then quotes the Didache (also referred to as The Teachings of the Twelve Apostles) , the oldest extant manual of church order, dating from the late first or early second century: "You shall not kill the embryo by abortion and shall not cause the newborn to perish." In 2004 the bishops of the United States, in their statement, "Catholics in Political Life," said: "It is the teaching of the Catholic Church from the very beginning that the killing of an unborn child is always intrinsically evil and can never be justified. This is the constant and received teaching of the Church. It is, as well, the conviction of many other people of good will." On the television program "Meet the Press," on Sunday, August 24, 2008, Speaker Pelosi spoke of herself and the bishops of her Church in these words: "So there's some areas where we're in agreement and some areas where we're not, and one being a woman's right to choose, and the other being stem cell research." In April of this year, in a teleconference with Catholic News Service and other media she made a similar remark: "I have a sort of serenity about the issue. I come from a family who doesn't share my position on pro - choice. The Church sees it another way, and I respect that." The bishops at the Second Vatican Council declared that, as Catholics, we believe what the Church authoritatively teaches on matters of faith and morals, for to hear the voice of the Church on those matters is to hear the voice of Christ himself. (Lumen Gentium, No. 25; Mysterium Ecclesiae, No. 2) Catholics believe that the Holy Spirit guides the Church and protects it from error. We believe that the Roman Pontiff, Pope Benedict XVI, is the successor of Peter, the Rock on whom Jesus Christ has built his Church, and is not just another man who is entitled to his opinions on faith. We believe that we are called to trust the Spirit to guide the Church, so we do not pick and choose among her teachings. Mr. Tom Brokaw, the moderator of "Meet the Press," asked Speaker Pelosi, "When does life begin?" She responded: "We don't know. The point is that it shouldn't have an impact on the woman's right to choose." Later: "I don't think anyone can tell you when life begins, when human life begins." Mr. Brokaw: "The Catholic Church at the moment feels very strongly that it begins at the point of conception." Speaker Pelosi: "I understand. And this is maybe fifty years or something like that." Speaker Pelosi's remarks called forth many responses, from Catholics in the pews as well as from bishops. As a result, on Tuesday, August 26th, two days after "Meet the Press" had aired, the Speaker's office issued a statement on her behalf. It contained this sentence: "While Catholic teaching is clear that life begins at conception, many Catholics do not ascribe [sic] to that view." That statement suggests that morality can be decided by poll, by numbers. If ninety percent of Catholics subscribe to the view that human life begins at conception, does that makes Church teaching truer than if only seventy percent or fifty percent agree? Authentic moral teaching is based on objective truth, not polling. For instance, in 1861, as the Civil War began, a majority of the residents of Massachusetts opposed slavery, a majority of the residents of South Carolina approved of slavery, and in Missouri people were sharply divided on the issue. Does that mean that, in 1861, slavery was immoral in Massachusetts, moral in South Carolina, and something of a moral "wash" in Missouri? Sound moral teaching demands much more good sense than that. Since August 24th many Catholics have written me letters and sent me e - mails in which they expressed their dismay and concern about the Speaker's remarks. Very often they moved on to a question that caused much discussion during the 2004 campaign: Is it necessary to deny Holy Communion to some Catholics in public life because of their public support for abortion on demand? I want to address that question in the light of the 2004 statement of the U.S. bishops, "Catholics in Political Life," and their 2006 statement on preparing to receive Christ worthily in the Eucharist, "Happy Are Those Who Are Called to His Supper." Both statements can be found on the bishops' website, usccb.org, and they lead the reader to conclude that this is a sensitive and complicated question, and does not lend itself to sound bites, headlines or slogans. In their 2006 document, "Happy Are Those Who Are Called to His Supper," the bishops begin by reminding Catholics that "the celebration of the Mass is the center of the life of the Church." The Eucharist joins each of us to the one sacrifice of Jesus Christ on the Cross, unites us with the Risen Christ, and unites us with one another in Christ. Each reception of Holy Communion looks forward to our union with Christ forever in heaven. The very first generation of Christians saw the need to examine one's conscience regarding one's worthiness to receive the Body and Blood of the Lord. Writing around 57 A.D., St. Paul told the Corinthians, "Whoever eats the bread or drinks the cup of the Lord unworthily will have to answer for the body and blood of the Lord. A person should examine himself, and so eat the bread and drink the cup." ( 1Cor. 11;27 - 28 ) Of course we are never fully worthy to eat the bread and drink the cup, as we exclaim at each Mass before we receive Holy Communion: "Lord, I am not worthy to receive you, but only say the word and I shall be healed." However, the unity nourished and expressed in Holy Communion can be broken by serious sin, hence our self - examination enables us to acknowledge whether we have committed such a sin, and to seek out the Sacrament of Reconciliation before eating the bread and drinking the cup. The practice of the Church is to accept this conscientious self - appraisal of each person ( Canon 912 ). Thus, in this matter the state of the person's awareness of his or her situation is of fundamental importance. As the bishops say most forcefully in the 2006 document, " we should be cautious when making judgments about whether or not someone else should receive Holy Communion." 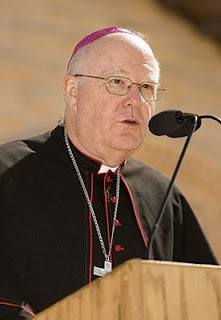 Nevertheless, the bishops go on to say: "If a Catholic in his or her personal or professional life were knowingly and obstinately to reject the defined doctrines of the Church, or knowingly and obstinately repudiate her definitive teachings on moral issues, however, he or she would seriously diminish his or her communion with the Church. Reception of Holy Communion in such a situation would not accord with the nature of the Eucharistic celebration, so that he or she should refrain." Why is this repudiation of Church teaching such a serious matter? The bishops respond: "To give selective assent to the teachings of the Church deprives us of her life - giving message, but also seriously endangers our communion with her." This teaching of the bishops does not violate the separation of church and state. That separation does not require a division between faith and public action, between moral principles and political choices. Believers and religious groups may practice their faith and act on their values in public life, and have done so throughout the history of this country. In his or her conscience, properly formed, a Catholic should recognize that making legal an evil action, such as abortion, is itself wrong. What of Catholics who find themselves questioning the teachings of the Church, or experiencing uncertainties and questions about them? The bishops answer, "Some Catholics may not fully understand the Church's doctrinal and moral teachings on certain issues. They may have certain questions and even uncertainties. In situations of honest doubt and confusion, they are welcome to partake of Holy Communion, as long as they are striving to understand what the Church professes and to resolve confusion and doubt." Cardinal William Levada, Prefect of the Congregation for the Doctrine of the Faith, and my predecessor as Archbishop here in San Francisco, wrote in 2004: "No bishop is eager to forbid members of his flock from receiving the precious Body and Blood of Jesus Christ, who invites us into communion with Himself and his Body, the Church, as grace and salvation." In that same year, the U.S. bishops acknowledged that pastoral sensitivity, and they endorsed the following approach to this question of denying Holy Communion: "Given the wide range of circumstances involved in arriving at a prudential judgment on a matter of this seriousness, we recognize that such decisions rest with the individual bishop in accord with the established canonical and pastoral principles. Bishops can legitimately make different judgments on the most prudent course of pastoral action. Nevertheless, we all share an unequivocal commitment to protect human life and dignity and to preach the Gospel in difficult times." From that statement I conclude that it is my responsibility as Archbishop to discern and decide, prayerfully, how best to approach this question as it may arise in the Archdiocese of San Francisco. I regret the necessity of addressing these issues in so public a forum, but the widespread consternation among Catholics made it unavoidable. Speaker Pelosi has often said how highly she values her Catholic faith, and how much it is a source of joy for her. Accordingly, as her pastor, I am writing to invite her into a conversation with me about these matters. It is my obligation to teach forthrightly and to shepherd caringly, and that is my intent. Let us pray together that the Holy Spirit will guide us all toward a more profound understanding and appreciation for human life, and toward a resolution of these differences in truth and charity and peace.